The Inateck BTSP-10 Plus tries to win the argument that loud equals good. For a cool 50 bucks, this speaker might be tempting, but if a quality build and passable sound performance are of even minimal interest, there are much better options out there. There's a fun trend occurring in the Bluetooth speaker market. Expensive Bluetooth speakers are facing endangerment by the growing amount of cheaper models that do nearly as good a job at pumping out music. Case in point, the UE Mini Boom. For just 100 bucks, its fantastic combo of performance, appeal and value make for a smart buy when put up against more expensive options. But a challenger approaches at just $49 (£49, about AU$64), looking to one-up that mini, but mighty speaker. Its name is the Inateck BTSP-10 Plus. It might not be the best-looking Bluetooth speaker around, but hey, with a loaded feature set and the ability to let out a loud roar for half the price, it takes the cake, right? Not exactly. For a speaker like the Inateck BTSP-10 Plus to play it cool with a low price, it sure has a bold appearance. Some will like its abstract, honeycomb-stamped design, but some won't. I'm somewhere pleasantly in between. While I can appreciate certain details, it's simply not pleasing to the eye and I'd rather not look at it for too long. What stands out first is the front grille. This red speaker cover is tucked, or rather, obstructed, behind some plastic honeycomb shapes likely aimed to give it some flair. Right above the branding on the bottom right of the front panel is a blue LED indicator. The perimeter of the unit is wrapped in a single strip of matte-coated plastic. This immediately earns some design points, as the sleek, shine-free look of the casing helps to aid in the otherwise cheap appearance. Its curves are flattened out with an angle, but are still fairly sharp to the touch. On the top of the BTSP-10 Plus, there are a few small buttons and touches that mirror the hexagonal aesthetic found on the front grille. The Bluetooth button serves both to pair with devices and answer or hang up telephone calls. Next to it are volume up and down buttons. Rather than the back, where ports are usually located, Inateck stuck them on the side of the BTSP-10 Plus. There's an auxiliary input, an on-and-off switch and a micro USB port for charging the speaker. There isn't much to see on the bottom other than a perforated section takes up a good amount of space to let the sound radiate for a little more "oomph". For the price, the BTSP-10 Plus includes a fair amount of extra goodies. In the box, you'll also find a basic carrying tote, a micro USB cable and auxiliary cable for manually connecting to a device instead of using the Bluetooth function. The BTSP-10 Plus implements every necessary function into the design, but it comes off lacking character and quality in the build. From the red grille that's so flimsy that it all but requires the honeycomb plastic pieces for protection, to the annoyingly loud "beep" noises the speaker makes, the design doesn't hide this device's budget trappings too well. 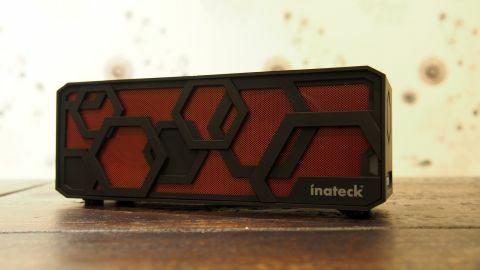 Inateck didn't go to great lengths in terms of design to fool anyone into thinking this speaker was premium, but that's not all that counts. We need to know how it sounds to give it a fair assessment on the whole. This being a small speaker puts a damper on what's possible in such a convenient form factor, but achieving the cheapest price point on top of that limits the possibilities even further. Unfortunately, the BTSP-10 Plus suffers greatly because of Inateck's mission to meet its low cost. The sound is hollow and flat. Bass and low-end response are almost non-existent, while mids and highs are tinny and abrasive. The soundstage served by the BTSP-10 Plus, despite being quite a bit bigger than the $99 UE Mini Boom, is somehow even more tightly squeezed together. At a low volume and from a distance, songs sounded decent. I was impressed with how loud this speaker is, but the brash delivery overall is more assaulting than it is pleasant. Regardless of price, it's fair to expect serviceable audio across a speaker's range of volume. Taking calls is easy enough with just a tap of the Bluetooth pairing button. The microphone picks up my regular speaking voice and spits out the caller's dialogue in kind. Beware: the ring notification from the BTSP-10 Plus is extremely loud. Perfect if you want to play a prank on someone who scares easily, but not ideal for regular use. The BTSP-10 Plus offers five to eight hours of battery performance, so says the instruction manual. My tests of quiet music listening landed its outage somewhere between those numbers. For just under $50, the Inateck BTSP-10 Plus offers up a sufficient amount of features. Five to eight hours of battery life and conference call capabilities are both solid perks for a speaker this cheap. I'll give Inateck some credit for the bold design. The design won't gel with everyone, but for those who do dig it, enjoy the honeycombs! At every turn, the sacrifices made in order to meet a low price point are all too obvious. The chintzy build quality makes a dull first impression. But most importantly, the sound quality is poor by almost all measures. The Inateck BTSP-10 Plus takes the cake as one of the cheapest, function-packed options around. It will perform just fine for those looking to amplify their podcasts or music for the shower. But if the BTSP-10 Plus is to be your first or primary Bluetooth speaker, know that you could throw another 50 or so bucks on an all-around better (but still budget) option.